First, when one enters from the Founders Statue, one notices that it feels cluttered. There is Astro Orbiter in front, flanked by some golden-looking metallic “boulders”. 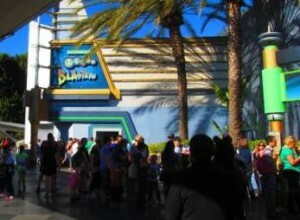 I have nothing against Astro Orbiter, although, with Star Wars-land moving in, this ride has got to go. Perhaps it would be best to relocate it to another part of the park. I also think that those metallic “boulders” ought to be changed. Perhaps something else could be put there that would make one feel as if they were entering some enchanted Star Wars land. As one continues to walk in, on the left, one sees Buzz Lightyear Astro Blasters and, on the right, one sees Star Tours: The Adventures Continue. 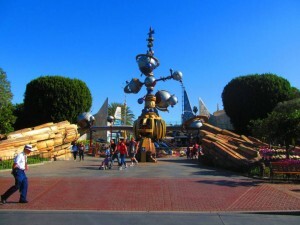 These are my two favorite rides not only at tomorrowland, but at Disneyland, in general. I have been to Disneyland before just to ride these two rides! I enjoy Astro Blasters, since it is an active (non-passive) ride, wherein one gets to shoot things and rack up points, which makes it pretty fun! 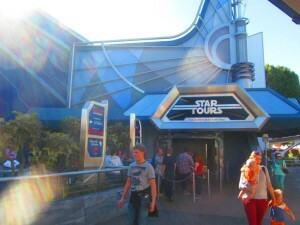 And Star Tours is great – not only because it’s a Star Wars ride (yay! 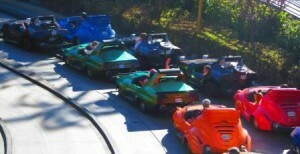 ), but also because, in the new version, the ride visits different places each time. 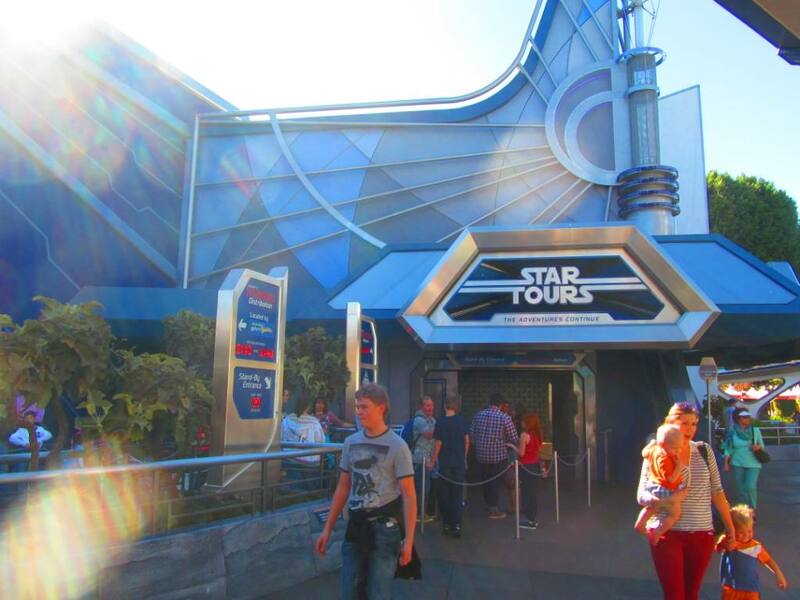 In thinking about changing Tomorrowland, Star Tours ought to stay. 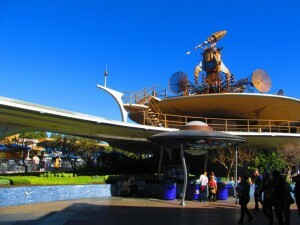 However, with a Star Wars theme, should Disneyland keep Astro Orbiters where it is and have it be out of place or should it move it to a different part of the park (notice I did not suggest they get rid of it – to do so would be sheer folly)? The next element of Tomorrowland one notices is the PeopleMover hub and its track. It is a gaping nothingness, which has sat dormant for years. 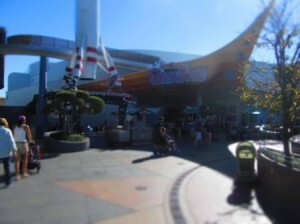 Not only is that a great space within Disneyland that could be used, it’s the central focal point within Tomorrowland. 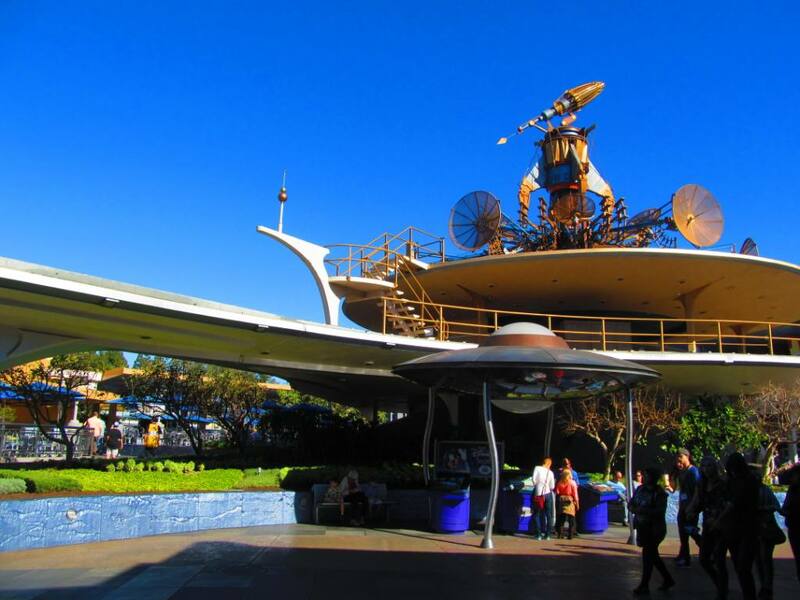 It’s an impressive failure of a use of physical space – not to mention ocular attention – within Tomorrowland (and Disneyland, writ large), which makes Tomorrowland seem less appealing. The PeopleMover is such a great opportunity: I have enjoyed the Tomorrowland Transit Authority PeopleMover at Magic Kingdom, and this could be a great way to take an overhead tour of the new Star Wars-land! Of course, they already have the tracks in place, they would just need to design new transportation vehicles, and they would need to totally redesign the hub to match up with the Star Wars theme. However, if the Imagineers decide to go in a different direction and remove the tracks altogether, I would be okay with that, which would open up a lot of overhead space. To the right, there is the Star Trader and Starcade, the former of which is where Star Tours lets out and is a Star Wars gift shop that blends into selling Disney merchandise and further blends into Starcade, which is an old-fashioned videogame arcade. Although the Star Trader already serves as an outpost, of sorts, for selling Star Wars merchandise, A) they need to make it entirely a space for Star Wars merchandise – there is a lot of Disney merchandise taking up a bunch of room. B) they really should expand their offerings and think more strategically as to making more activities or products to buy; I feel that they are not using that space well enough to really sell the Star Wars products. In the new Star Wars-land of Tomorrowland, the Star Trader really should have a lot more focus and attention on it to serve as a serious hub of Star Wars merchandise in Southern California, making it more of a destination for Star Wars fans. As to the Starcade, it’s absolutely got to go. 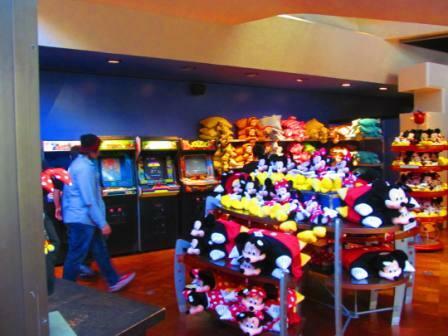 Even if there are people who still go to arcades to play video games, why would someone want to come to Disneyland just to play old video games? This is entirely baffling to me. Disneyland would be much better served if they sold off the games (I would imagine that Disneyland would make some significant cash off of selling these games) and either used that space to sell more Star Wars merchandise (they’ve already encroached upon the games’ space by moving Disney merchandise into the area) or to refashion it entirely and use it as a space for something else. I’ve never been a fan of the space where the bathrooms are where Space Mountain lets out…. 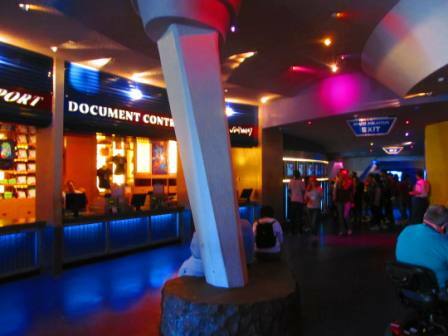 As one continues to walk over to the right, en route to the restrooms is a dark corridor adjacent to the Starcade and where Space Mountain lets out. I don’t know if anything can be done about that, but I think that, too, needs to be changed. Continuing in that direction is Space Mountain: I have never ridden it, nor do I care much about it, although one of my friends certainly thinks it should stay. However, next to it is Captain Eo, which is nice to watch once or twice, but not much more than that. 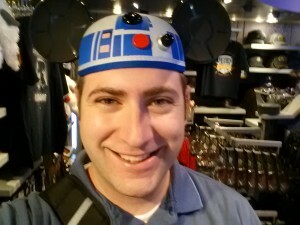 Perhaps a new Star Wars experience or a few can be experienced in 3D, perhaps a different cycle of shows, a la Star Tours…. 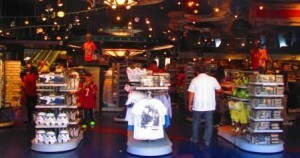 Maybe Captain Eo can be moved over to Disney’s California Adventure. 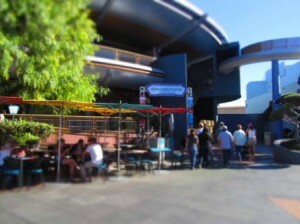 Redd Rockett’s Pizza Port should definitely go – it will no longer have any connection to a Star Wars-themed place. This offers up an interesting opportunity to create Star Wars-themed foods…. Maybe even the pretzel carts could sell pretzels in the shapes of Star Wars characters like they already do with Mickey Mouse-shaped pretzels. Perhaps the other snack stands could also sell other Star Wars-themed snacks…. What’s the deal with Innoventions? That is so not interesting. That’s got to go. Next is the worst part of Tomorrowland: Autopia – at least in my humble opinion. At Autopia, people go to a theme park to get stuck in car traffic 🙁 Granted, at one point in time, it might have seemed novel to experience driving, but I think people have to deal with it in real life, why should they come to Disneyland to do that? But what’s even worse about it, as I’ve written elsewhere, is that even walking by it, one smells the horrible carbon monoxide emissions from the cars, which is offensive to one’s olfactory senses, and contributes to an unpleasant experience at Disneyland (of course, there’s also the matter of all of the air pollution, as well, which is also bad). It’s also pretty loud just walking by, but the offensive smells are much worse 🙁 This needs to be gotten rid of. As to Finding Nemo Submarine Voyage, I don’t know what should be done with it. When I visited last week, it was under refurbishment, although, I don’t know how exciting of a ride it is (I rode it once and didn’t particularly care for it). It’s an interesting concept to have an underwater ride, especially in submarines. Although it would be great to have it be transformed into a Star Wars-themed ride, since it’s on the periphery of Tomorrowland, it could remain as it is…. Lastly, there’s the Jedi Training Academy, which is nice and should be kept. Those are some of my thoughts. In discussing the above with others, I realized my viewpoint is not that of someone who grew up with Disneyland (although I did grow up going to Walt Disney World every few years), so I do not have the nostalgic element attached to various rides/attractions at Disneyland, which is easier for me to suggest changes at Tomorrowland, since I only went there for the first time less than four years ago, than for those who grew up with it. Looking forward to see what the future brings at Tomorrowland! 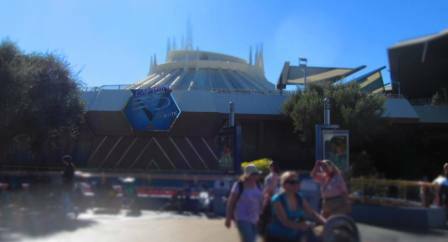 Go back to Tomorrow Land and ride Space Mountain!!! You owe it to yourself and to the rest of us reading this blog! !